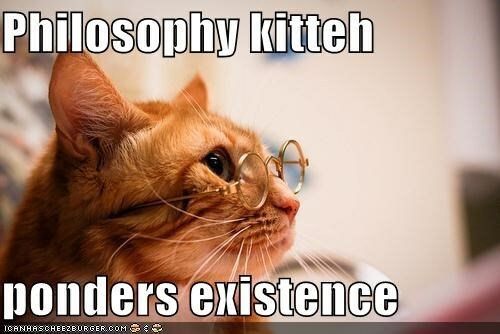 Over the years I have tried to study philosophy. Since it's such a huge subject with so many facets, trying to do so without guidance has been difficult. Last week while perusing the books in the library our church maintains, I stumbled across a copy of What is Philosophy? by Dietrich von Hildebrand. That title certainly sounded promising and the author was known to me so I dragged the book home. Good thing I did since the available copies on Amazon range from $70.46 to $959.13. Good grief. On page 7 of the introduction I read the following and had to go back and reread it at least 10 times. Keep in mind this book was published in 1960. Positivistic, relativistic, and nominalistic pseudo philosophy gains more and more influence as an official philosophy in colleges, implanting an attitude of excessive awe toward science in the mind of the average man. Paradoxically, an increasing unrest and longing for true philosophy is engendered by the fact that this "philosophy" simply ignores all the vital problems of man, his life as a personal being, his happiness, his destiny. It is engendered by the unrealistic, non-existential, and insipid character of this "antiphilosophical" philosophy. This pseudo philosophy, in which science takes the place of metaphysics and religion, more and more corrodes the life of man, making him more and more blind to the real cosmos, in all its plenitude, depth, and mystery. It imprisons man in a universe deprived of its true light, of the features which give meaning to everything, such as good and evil, true and false, right and wrong; it locks him in a universe which is dehumanized, reduced to a "laboratory," stripped of all color, a universe in which all the great and fundamental realities of a personal human life are ignored, ousted, or denied. Today we are witnessing an inner revolt against the deformation expressed in this pseudo philosophy, a revolt which dramatically manifests itself. The great number of suicides, greater than in any previous period of history, the great number of mental diseases, the frightening increase of juvenile delinquency, all eloquently disclose the inner revolt against positivism, with all its metaphysical boredom and suffocating dullness. Never was the need for a true philosophy more urgent; and "true" is meant: first, a genuine philosophy instead of a philosophy which has abandoned the very character of philosophical knowledge, and, second, a philosophy which does justice to reality in its content. Never was philosophy more of an existential vital need, because never before has the naive approach of man to being been so corroded by a pseudo philosophy which makes a fetish of science. "Coincidence is a messenger sent by truth"
Yesterday at American Thinker the article by Alexander G. Markovsky, The Ideological Conversion of the Democratic Party, and a 2015 article from the Atlantic, The Coddling of the American Mind, made their merry way unto my monitor. Over at Liberty's Torch, Francis Porretto penned a rather philosophical article on Feminism, On Making The Best Of Things...Including Yourself. While researching the various disciplines mentioned by von Hildebrand, I stumbled (I do a lot of aimless stumbling) on a site The Basics of Philosophy by Luke Mastin. He states: This website was created as a personal project by Luke Mastin. He has no official training in philosophy and this site is intended as an entry level resource by a laymen for the layman. For a visual learner - a lover of order, time-lines, and clocks with hands so one can "see" the passage of time, this website is a perfect systematic outline of philosophy for the neophyte.